Filled with easy-to-follow tips on getting fit and staying healthy. 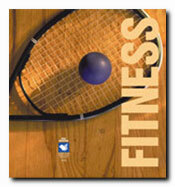 A great resource for motivating people to improve their physical fitness. Includes topics such as setting fitness goals; choosing footwear; specific activities such as walking, jogging, stair climbing and step training; and preventing and treating athletic injuries. This kit is one section of the more comprehensive Fitness & Nutrition Kopy Kit, which is also available in full-color CD-ROM format. Why Warm Up? Why Cool Down? Tips for Exercising Safely Are You Overtraining?